With the exception of a quick once over with some 100 grit paper that should take 10 minutes or so, the cabintop is ready for the first coat of primer. Every square millimeter is sanded to either bare glass or I've done the MEK (Methyl Ethyl Ketone) test to ensure the base coat or primer is ok to lay down a 2 part system on it. 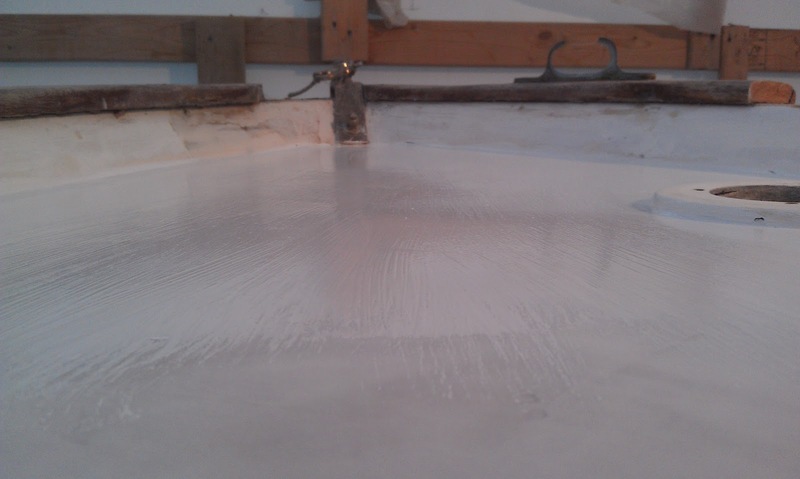 I am soooo done with sanding for the time being. I know there's lots more, but I need a break. 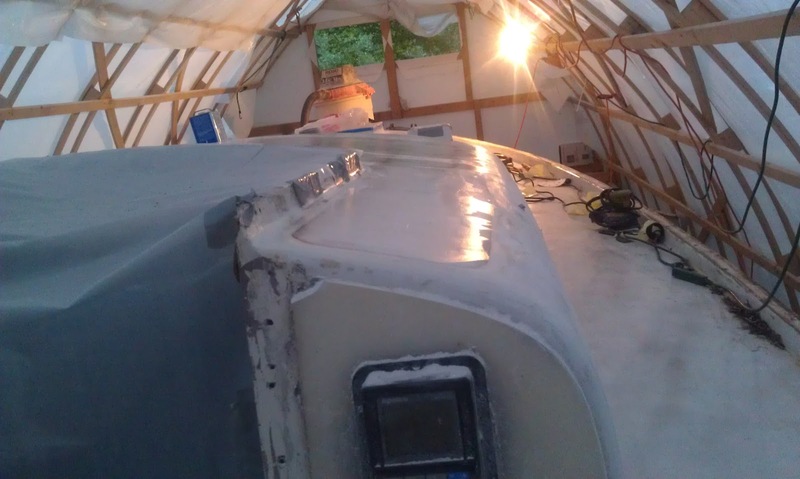 The MEK test is also known as a solvent rub test and it's nothing more than taking some Interlux 2333N Brushing Reducer (or some other MEK product), saturating a paper towel and then placing it on the deck with a plastic bag taped down over it. This ensures that little of the product evaporates. Then wait 24 hours before taking it off. If the coating on the deck peels or bubbles where it was in contact with the MEK, then it must be removed before painting with a 2 part paint. I did this because I wasn't sure that the grey paint on the deck was a 2 part paint or not. 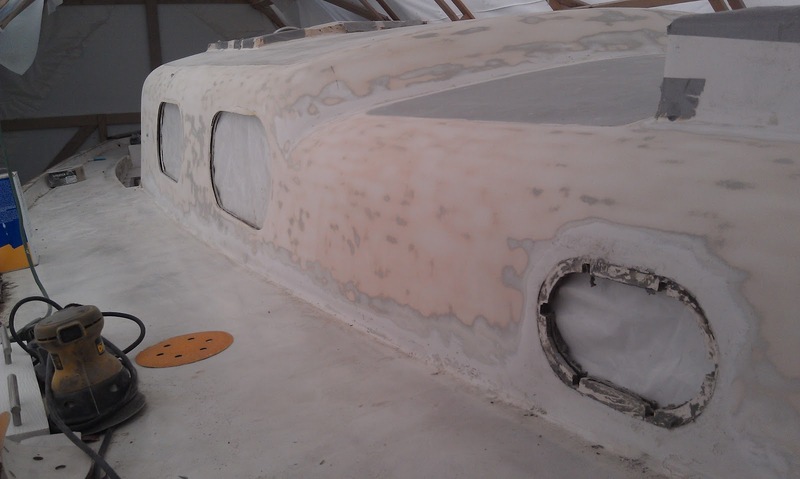 It was as hard as granite and didn't come off like any 1 part paint I've ever used, so I suspected that it was a 2 part paint but the Interlux rep on the yachtpaint.com forums suggested that I do this test just to be sure. 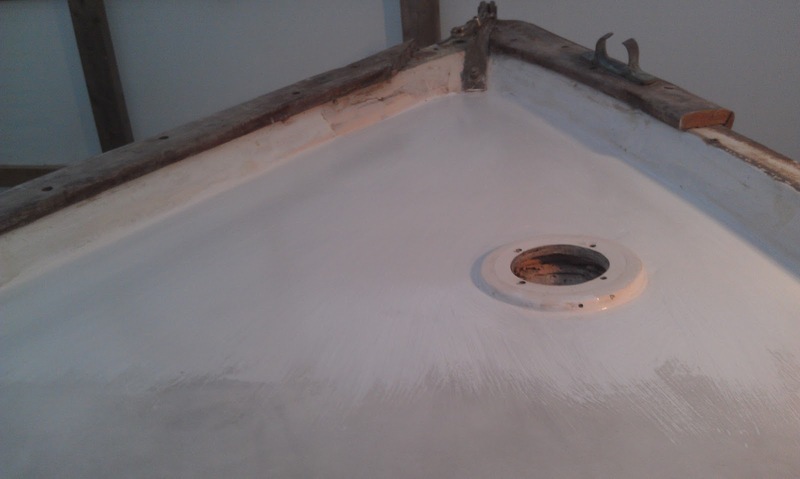 Luckily, after 24 hours the paint was still hard and there wasn't any cracking or bubbling. I would have preferred to take it all off, but nothing short of my angle grinder was taking it off (I went down to 40 grit on the orbital and it just didn't cut the base at all). 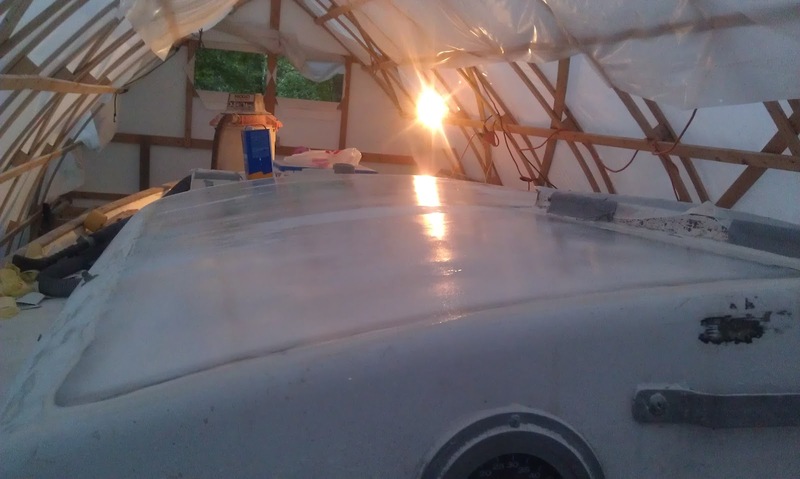 I had hoped to get started on the priming this week since the Interlux Primekote came on Monday, but I'm headed up to Maine tomorrow for the week and I had too many things to wrap up at work and get stuff together for camping. It will have to wait until I come back. 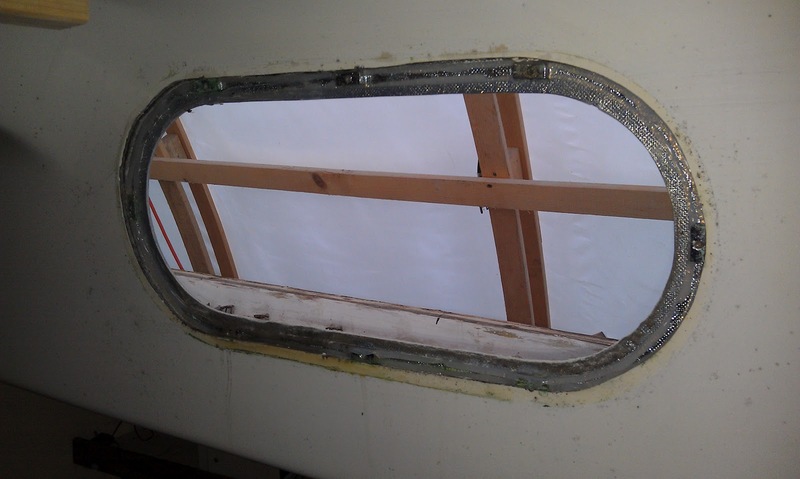 Fortunately, I will have 3 days to work on the boat when we get back from Maine before I have to get back to my real job. 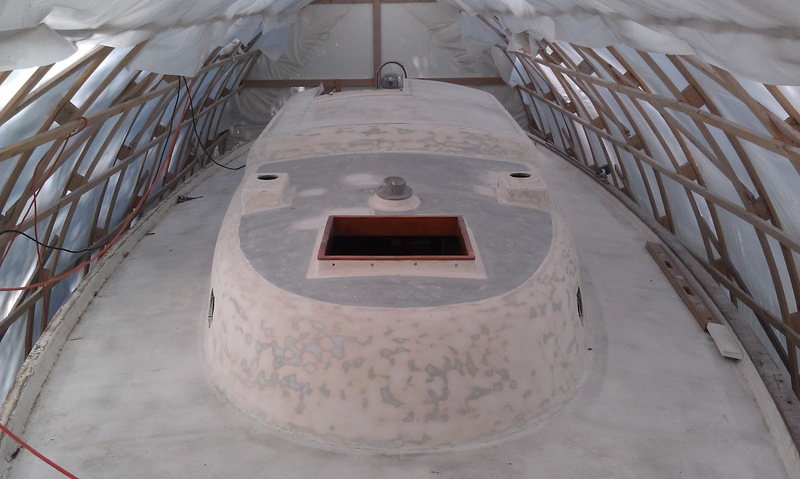 I'll be back at it on the 8th and will be making a push to get the first coat of primer on all the decks by the following weekend (the cockpit will have to wait a bit longer). After that I can start focusing on the fun things like building the mahogany toerail, new cockpit coamings, and a myriad of other things. 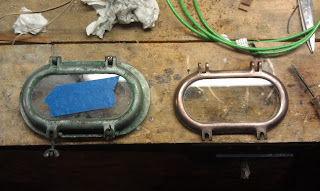 After pulling my bronze portlights a few weeks back I've been researching ways to clean them up. What I originally intended was to have everything re-chromed, but I just couldn't justify spending so much on a cosmetic thing (over $1k for everything). 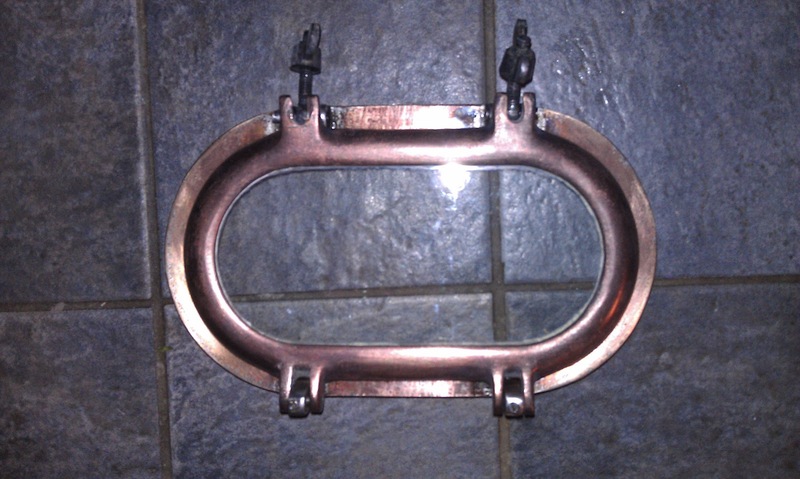 Anyway, I like the look of raw bronze in both the polished and patina'd forms so I started looking into the various cleaning techniques out there. There are a lot of threads on wire brushing and polishing and generally labor intensive methods that I wanted to avoid because I am basically a lazy person when it comes to polishing things. I had some recommendations that Muriatic (HCL) acid worked well and I even picked up a jug of it at Home Depot. However, during my research I stumbled onto several forums that were devoted to metal platers (eveyone needs a hobby right?) 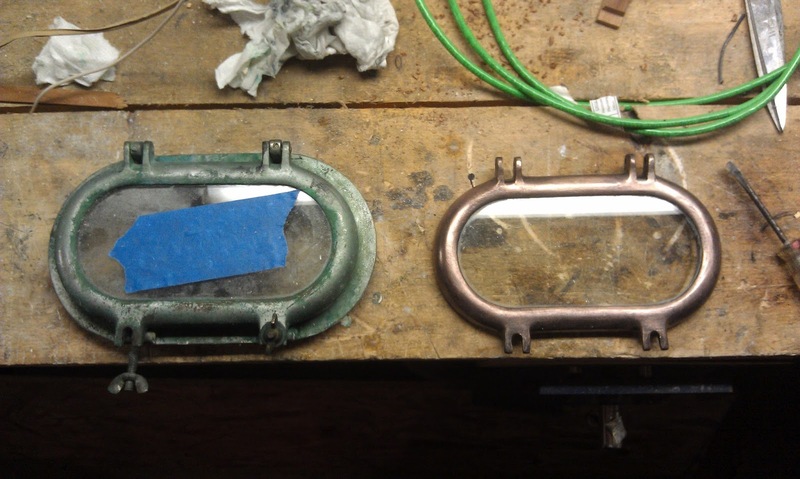 and many indicated that strong acid on bronze can lead to bronze disease because the acid is an equal opportunity dissolver; it will just as happily attack the tin in the bronze as it will attack the chrome. 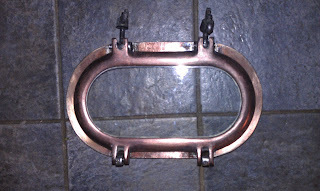 While on one of these forums I saw a few references to electrolytic de-plating and how it does a great job at removing chrome and rust and best of all, you don't need to spend hours and hours polishing and sanding. After corroborating the method with some more research on the theory behind the method, I decided that it was worth a try and I had most of the materials/equipment needed already. So before I describe what I did, I want to give the standard disclaimer when bad stuff could happen: I am not responsible for any death, dismemberment, shock, hazardous waste, or anything else that could be construed as bad. Just do your research and be careful; the big risk is shock if your not careful and properly disposing of hazardous waste after your done. Small length of wood to span the bucket. Wire the rebar together with some of the house wiring. Add a few gallons of water and add a cup of sodium carbonate to make the electrolytic solution. 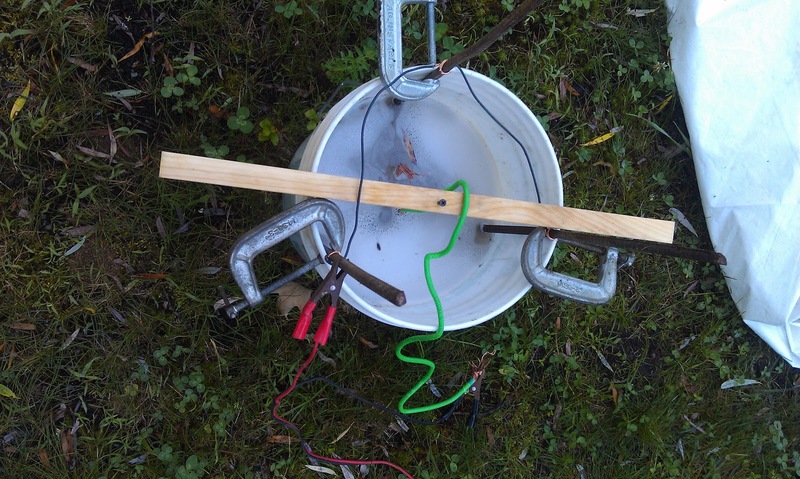 Suspend the wired part on the piece of wood in the middle of the bucket so that the part is submerged. Connect the positive lead from the battery charger to one of the pieces of rebar and the negative lead to the wire connected to the part. 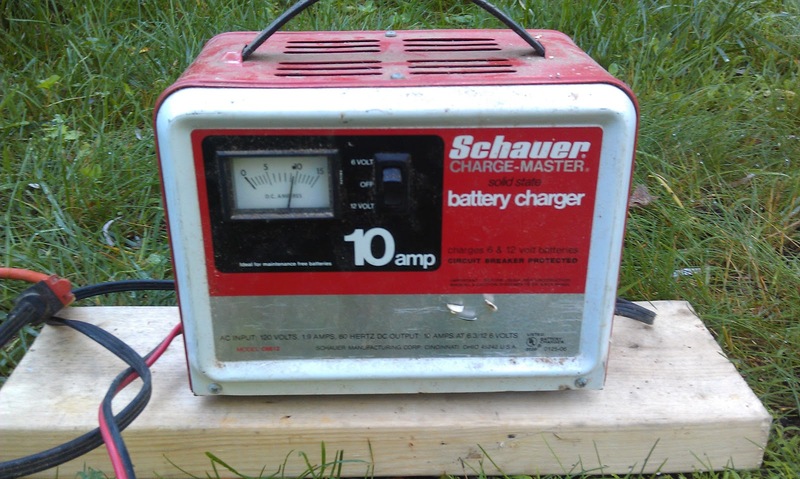 Turn on the battery charger. Both the rebar and the part should start bubbling in short order. 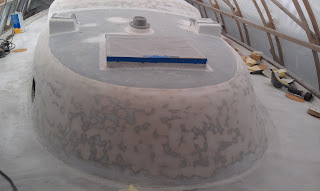 Remember that this should be done outside or a well ventilated area because the fumes are potentially toxic. I left each part in between 4 and 8 hours before pulling it out. When it first comes out the part will be black, but putting it in another bucket of water and give it a good scrub with a scotch brite pad will bring out the bronze shine. 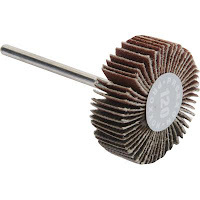 All in all it is WAY easier than trying to polish or wire brush them. So far, I've only done one portlight and an anchor chain hawser, but the results are incredible. I think I could have left the portlight in a bit longer because there are still a few sections of chrome (or possibly nickel) that proved to be pretty stubborn to remove. I may buff these out or dunk it again at some point but it's good enough for now. Another word of caution: what I've read is that the bi-product contains hexavalent chromium (of Erin Brockovich fame). It should be disposed of properly and I have an empty 2.5 gallon screw top container that I plan on using and bringing to hazardous waste day at our dump (they hold it periodically). I've spent way too much time on the original cabintop (the only section that wasn't completely recored) this week. 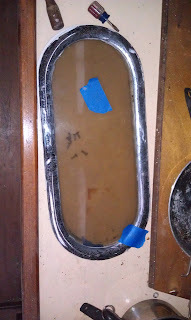 I thought it would be the easiest part of the whole boat, but the old paint ended up being harder than granite and I stubbornly thought I could sand through it with 40 and 60 grit paper. I even tried a flapper wheel with 36 grit paper to no avail. Since I'm planning on using a 2 part LPU paint, it can't be applied over a 1 part paint and since I'm not sure what the old paint is, I figured the safest bet would be to get rid of all of it, but short of busting out the angle grinder (I just don't want to go there), it just wasn't coming off. After speaking with an Interlux rep. for the second time this week, he told me that I can do an MEK test to determine the suitability of the underlying substrate. 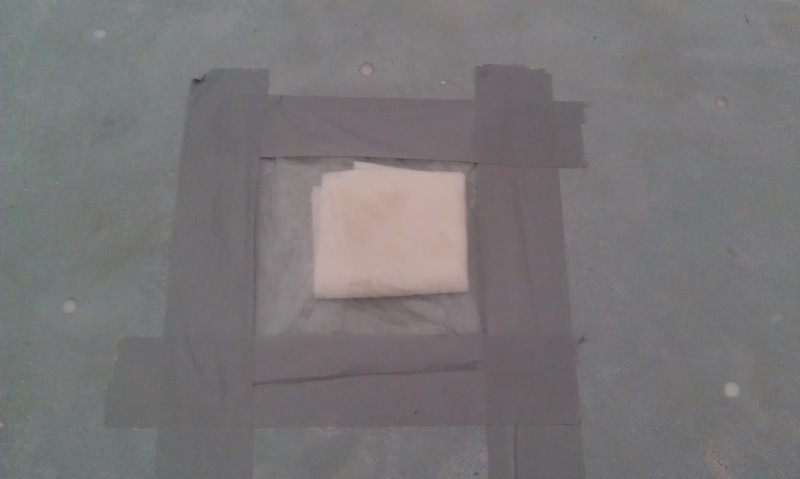 Basically you soak a rag with 2333N (Interlux brushing reducer), place it on the substrate (deck), and tape a bag over it so the solvent can't evaporate. 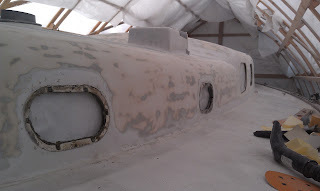 Leave it for 24 hours and see if the underlying paint blisters or cracks. If it does then it has to be removed, if not then it's fine to use as a substrate for a 2 part primer. 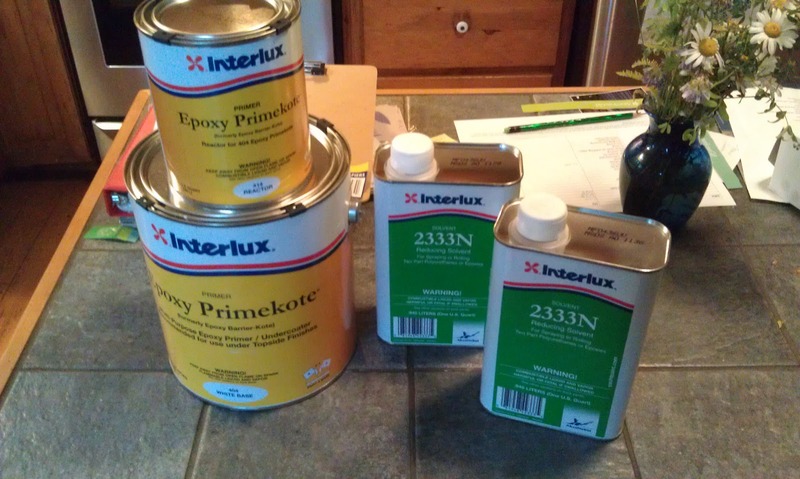 So I ordered a gallon of Interlux Primekote primer and a quart of 2333N Brushing Reducer to perform the test. Hopefully the test will come out positive (I don't have to grind it off) and then I can move forward with at least thinking about priming. 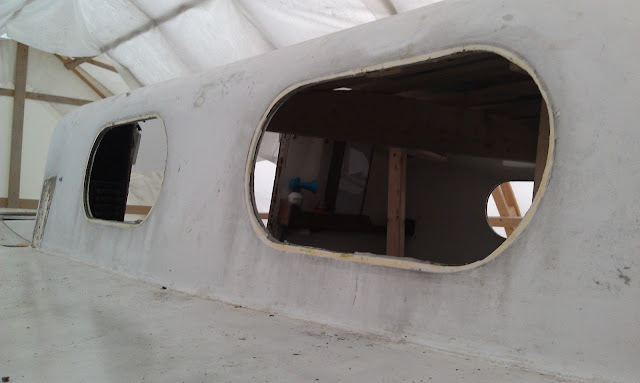 On the fairing front, I continued longboarding the recored section of the cabintop (yep gonna need more work to make it fair) and did a final fill on the holes that I did my test bores on at the beginning of this project. It feels like I'm barely moving along and just making more dust, but I guess it's going in the right direction. Ok, so maybe I disappeared for a while, but I'm back on the job again. I pretty much squandered the winter doing nothing but I was burned out from my previous efforts and needed a bit of a break. I feel a little guilty about it, but this is a long term project and I'm not going to kill myself getting it done. With that said, I did about 1.5 hours of work sanding the foredeck to see how fair it is. I'm happy to report that it looks pretty darn good. Not perfect, there are a bunch of spot fills I'll have to do before I'm really ready for paint, but given that the vast majority of the deck will be under Kiwigrip (which will hide many a sin), I'm not too worried and can live with a few imperfections. 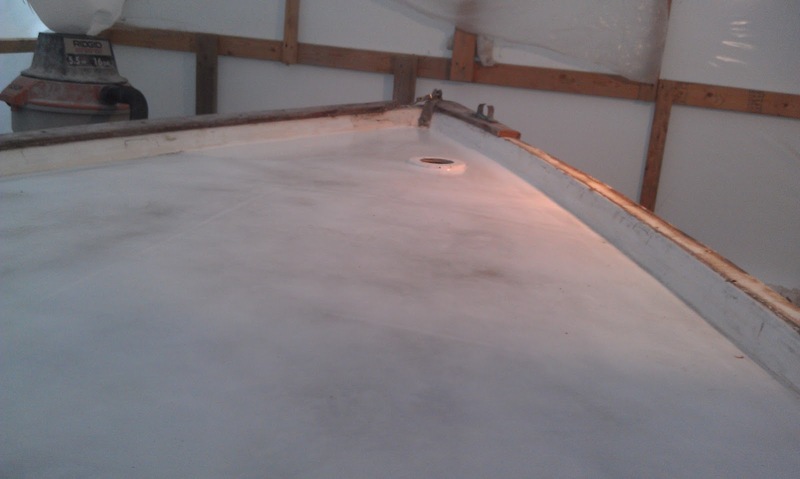 I decided that I would spread a quick coat of primer right at the bow to see how it looks and I'm very pleased. Of course, I slapped the primer on in just a few minutes with a brush and will have to sand it off before I get the real primer on, but it was really satisfying to get a glimpse of the finished project. 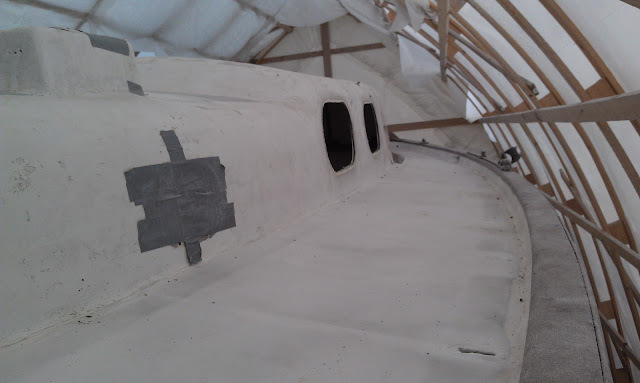 Those are brush marks not fiberglass scatches. Without a uniform color, it is hard to tell if it is fair. 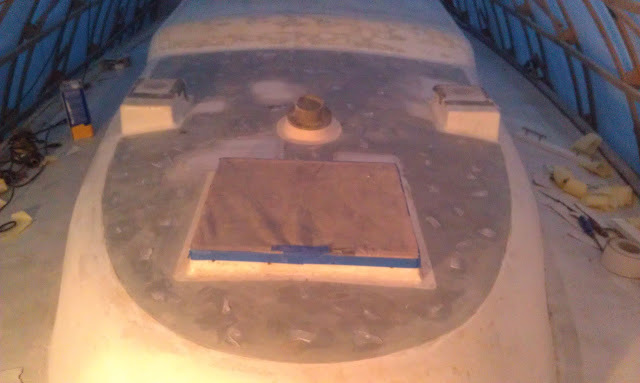 The biggest problem I'm finding as I sand my way aft (6" Rigid Random Orbit) is along the bulwark/deck junction. I'll have to go along the whole edge on both sides and do a small radius filet from bow to stern. Then I'll have to fair that in, so it's a bit of work. I'm putting the toerail project on the back burner for the time being while I re-assess my method. I was going to do 3 - 1.25 inch strips laminated together and bent on a jig, but some helpful advice on the plastic classic forum has me rethinking the project. Stay tuned!